Last night at the Marthaguy camp was so beautifully quiet that I came to the conclusion that I’m addicted to silence. In the silence I got to thinking about the noisy sleepless nights I have had when on the road. I thought of India mostly because when travelling overland in 1970 from Colombo to London I had many restless nights due to the hubbub of traffic, sitar music and people banging on the side of our Landrover, in which we slept. From the Marthaguy we pushed on to Carinda from where we intended to go to Gongolgon and then Bourke but due to inadequate signage we managed to get lost. We knew we were off course when we passed by Billybingbone Station to the south of where we should have been. 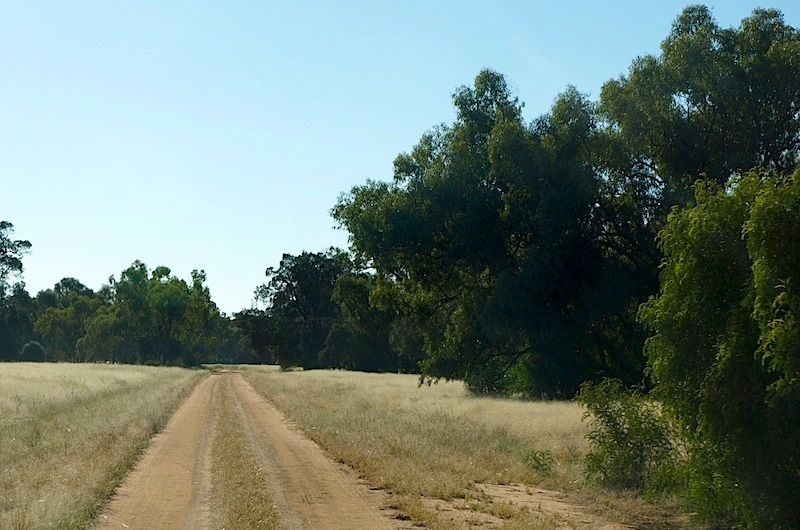 Revising, we headed for Coolabah, a small outpost between Nyngan and Bourke. 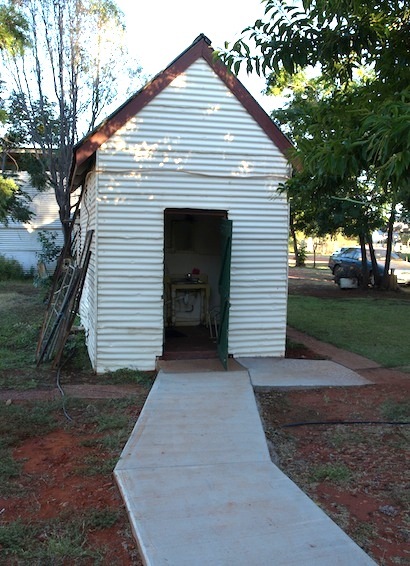 It is 128 kilometres from Coolabah to Bourke with only one watering point in between and that’s Byrock. Byrock was named after an early settler named Bye who built a hut near a rock spring and named it Byerock. Some years later when a post office was established the franking stamp sent up from down south came without the ‘E’ so from then on the locality was known as BYROCK. Record-breaking rains this year have produced a vast amount of vegetation. Grasses a metre high were growing right up to the wheel tracks and trees and shrubs carried a massive amount of foliage. Bev and I have never seen the country looking so abundantly green. This road is what we call a fair dinkum backtrack. 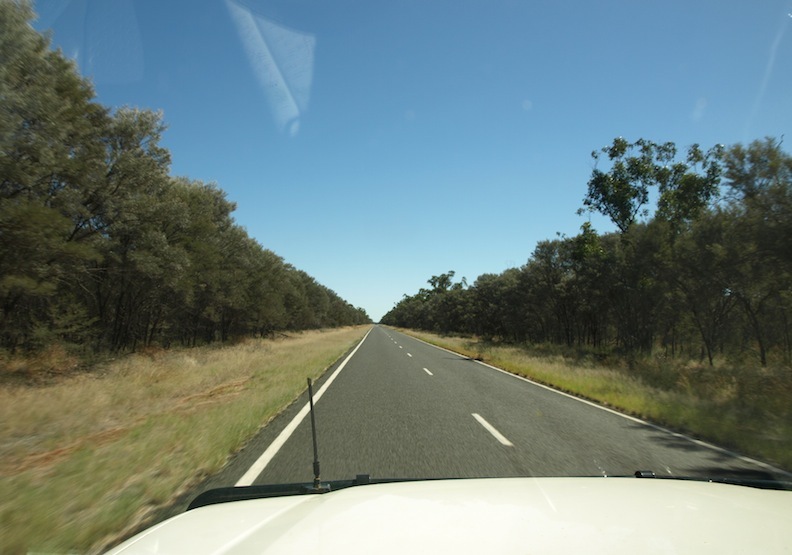 We never tire of travelling along roads like this lined with Bimble box, Leopardwood and Wilga. It beats highway travel any day! Some of the best camps we have had have been in this sort of country. Today we passed by a property where I had a very embarrassing moment when working as an engineering surveyor in the 1960s. I visited the property to survey a dam site and as my field assistant and I left the homestead to start the survey the property owner suggested we come back to the homestead for lunch. In the 1960s eating at some homesteads was a formal affair meaning it was necessary to wear a coat and tie. I carried both just in case the occasion arose. My embarrassment came at the lunch table when I dismantled the pepper grinder; I had never seen one before so I didn’t know how it worked. The bits and pieces fell into my soup, the property owner said ‘Fool, boy’ and to make things worse, after we finished the meal, I excused ourselves saying we had to get back to surveying the billabong if we wanted to finish before dark. When I stood the owner said, ‘Boy, you can’t go yet. Aunty hasn’t finished her tea’. We sat down and waited patiently for Aunty to finish. Such was the delay that we finished the survey by the headlights of the car. The irony of this story is that thirty years later the owner of the property bought a piece of my ceramic work and we laughed about my gaffe with the pepper grinder. The following day I visited another property nearby where the owners were the opposite of the day before. They had few airs and graces; they were what we called battlers, akin to Steele Rudd’s Dad and Dave and their mob. My job on this day was to survey a pipeline route from a bore to the homestead. The lady of the house invited us to the homestead for lunch, no need for the tie and sports coat this time. To our surprise, lunch was cold porridge with tomato sauce! The table we sat at was one of those blue mottled Laminex jobs with extruded aluminium edging. One corner of the table was missing, it looked like a giant hand had torn a section out. On enquiring what happened to the table I was told, ‘Aw, the boy was cleaning the shotgun one night and it went off and blew the corner away!’ My field assistant and I were to sleep on the veranda that night and before retiring we asked what the go was for a shower. We were told they didn’t have a bathroom and that bathing was undertaken at the bore, a long drive from the homestead. 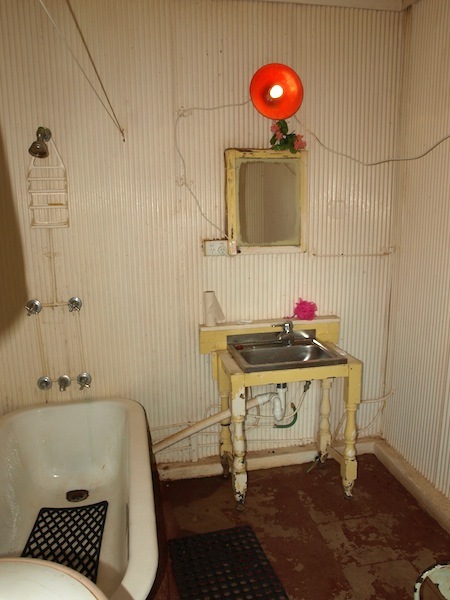 At the bore there was no bathroom, just a steel star-iron with a steel tractor seat attached, driven into the ground directly under the shower rose. Sitting on top of the bore head was a ratchet-type hand pump; the discharge went up into a huge shower rose, it probably held close to ten litres of water. The procedure was to pump madly, fill the shower rose and whilst sitting under the cascading water soap up. To rinse off the shower rose was filled a second time. These battlers had to be inventive to survive; the shower arrangement was a classic example. Another of this farmer’s innovations related to the hand feeding of his dying cows during the 1965 drought. Emaciated cows were suspended from trees by ropes attached to hessian bags, which were slung under their bellies so they were suspended in the standing position; the owner told me, ‘If they go down, it’s the end of ‘em’. In the 1960s when I travelled this road in the course of my work it was a boneshaker as it was unsealed. Corrugations, potholes and large gibbers took their toll on the EJ Holdens we drove. There were few 4WDs in those days so we bashed around the bush in EJs fitted with winter tread tyres and chains when in the wet. The government-supplied cars had no heaters or air-conditioning. Such items were optional extras, if you wanted a heater you bought your own. The road from Nyngan to Bourke (202 km) runs straight and parallel to the long since abandoned Dubbo to Bourke railway line. I travelled on the train from Dubbo to Bourke in the 1960s when working for the WC & IC. I now consider the train trip an historical privilege. Some very famous people travelled by train to Bourke, one was Henry Lawson. In the late 1800s Lawson was living in Sydney and writing for the Bulletin but because his drinking habits were interfering with his work the editor bought him a one-way ticket to Bourke and said ‘Don’t come back until you can write some good copy’. 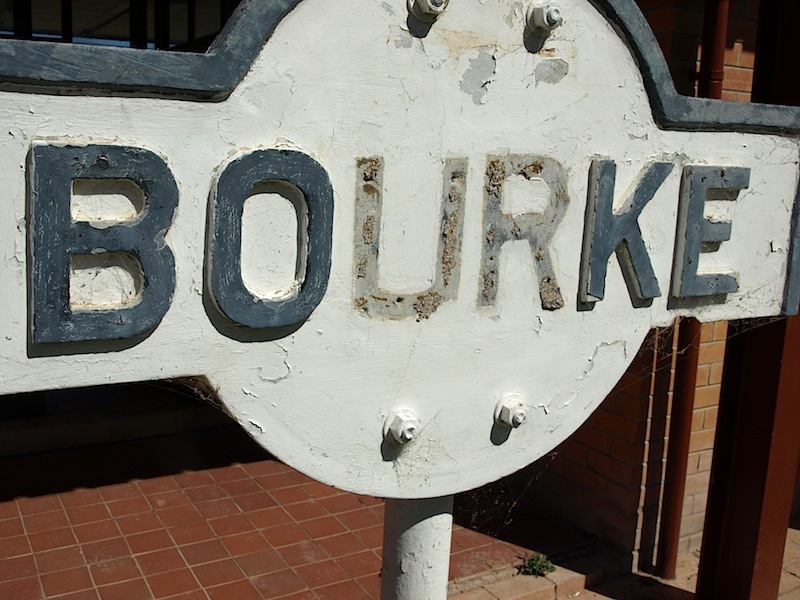 Lawson didn’t like Bourke much as the area was in drought. His impressions of the country are reflected in his poem, Song of the Darling. It’s easy for me to wax lyrical about the writings of Henry Lawson. I do so, not only because I admire his way with words but also I know by association what the back country can be like having lived and worked out the ‘Back-o-Bourke’ in all seasons including drought times. 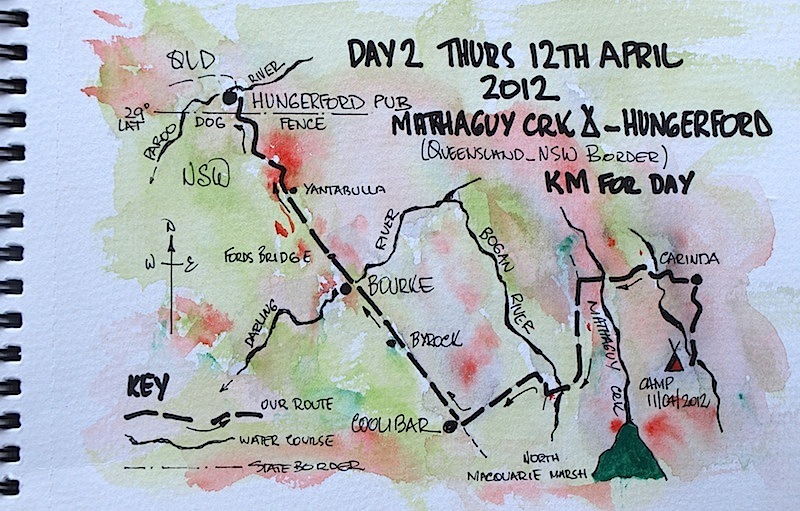 After a spell in Bourke, Lawson decided to walk to Hungerford, 112kms NW of Bourke, the same track we were on today. At one stage of my surveying career I was acting OIC at Bourke and in need of a field assistant so the senior engineer at HQ Sydney sent me a lad who had never been west of Katoomba. I picked him up at the Bourke train station on a stinking hot January day and the first thing he said with a stutter was, ‘It’s ho ho hoooot here! He only lasted two weeks as the daytime temperature hovered around 45 degrees Celsius (the maximum ever recorded in Bourke is 49.7 degrees). The final straw for him was when a plague of Lavender Beetles hit town; the smell was horrific, it almost made me want to leave as well. Today we went past the old WC & IC office, which is now, a private residence but, for me, the old office holds a lot of memories. In midsummer I used to sleep on the floor in the hallway which was the coolest spot because of the evaporative cooler at the end of the hall. This sign may have seen Lawson pass by. I wonder what the circumstances relating to the missing ‘U & R’ were. I asked at the local tourist information, they didn’t know. Maybe someone removed the UR to make the word BOKE, which is the name of a railway station in India. Soon after leaving Bourke town we crossed the mighty Darling River. The modern bridge across the Darling is a flash concrete affair but the old North Bourke Bridge close by has an interesting tale. The bridge was built at a narrow section of the river but there was problem and that related to the road alignment. To achieve a straight exit/approach on the northern side meant the pub on that side would need to be demolished. This was definitely not on so the bridge roadway was built with a dogleg. It was rather odd driving across a bridge with a dogleg in it. Vehicles no longer use the bridge but it is open to pedestrian traffic. 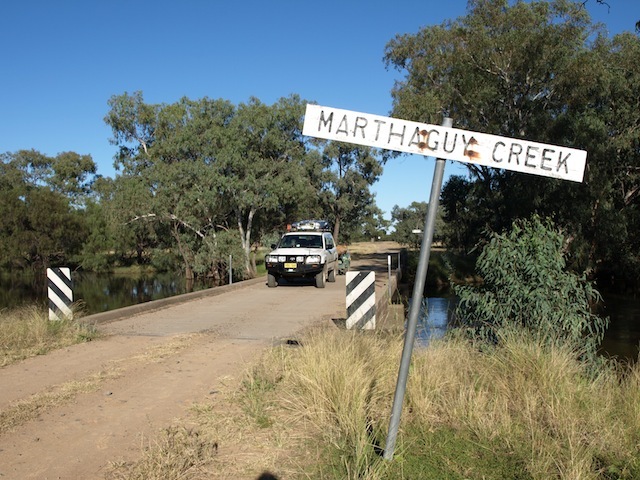 It is said that once you cross the Darling you are in the outback. It’s where the crows fly backwards to keep the dust out of their eyes, it’s where men are men and women are scarce and it’s where all sorts of devious outbackery happens, like building a bridge where the approach road runs through the middle of a pub! 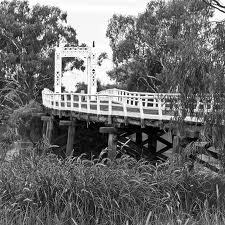 North Bourke Bridge. These two bridge photographs show the dogleg in the roadway leading off the bridge. The relatively new North Bourke Inn is on the site of the old pub and, as can be seen, it is smack in the middle of the road had it gone straight ahead. Another example of outbackery is that at some time someone must have tried to get a wide load across the bridge but it was a little too narrow so they took to the bridge cross-braces with oxy-acetylene and cut pieces off so the load could pass through. These two photographs are from Tim J Keegan’s photostream via Flickr. Thanks Tim. 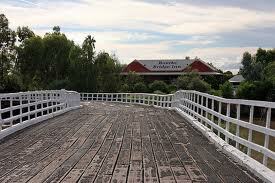 When Bev and I were running Backtrack Tours we took hundreds of people to the bridge. We even chartered the Jandra, a paddle steamer replica, which took our clients for a night tour along the Darling. We have dozens of photographs similar to the two shown here but the images are at home and I can’t access them so that is why I have borrowed Tim J Keegan’s images. 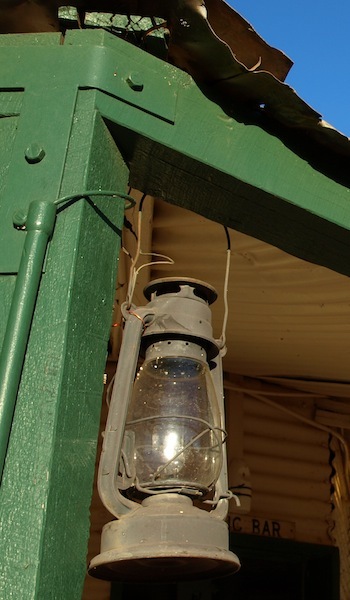 From North Bourke we headed northwest to Hungerford on the NSW Queensland border following the tracks of Cobb and Co and Henry Lawson. How many people have sauntered in and been chucked out through this door over the decades? When Lawson visited Hungerford there were two pubs and of the two the Royal Mail was the one he wrote about. An extract from Henry Lawson’s famous sketch ‘Hungerford’ which appeared in While the Billy Boils (published in 1896) was written after Lawson had visited the town in the summer of 1892-1893. ‘Hungerford consists of two houses and a humpy in New South Wales, and five houses in Queensland. Characteristically enough, both the pubs are in Queensland. We got a glass of sour yeast at one and paid sixpence for it – we had asked for English ale. 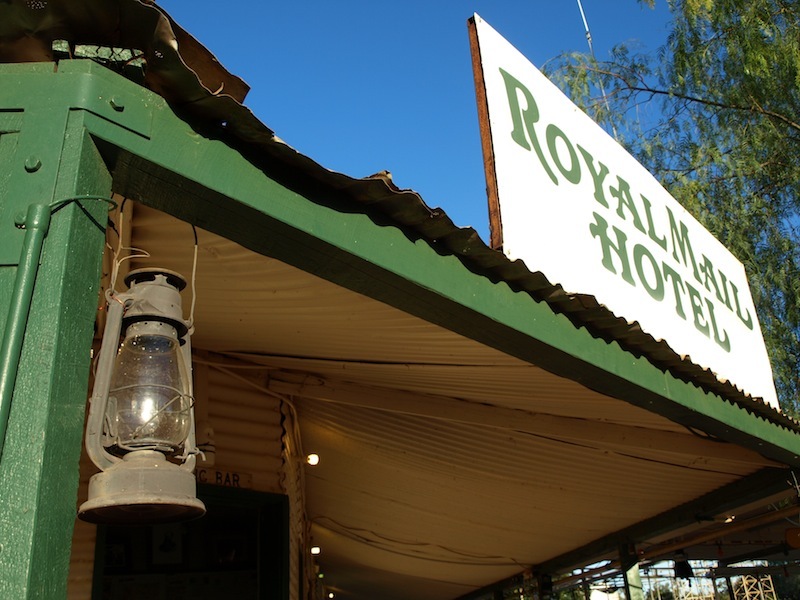 Lawson described the hotel as a street-larrikin with ‘its hat pulled down over its shifty eyes’, the hotel veranda roof being the hat brim and the windows its shifty eyes. He also wrote of Hungerford, ‘you have no idea of the horrors of the country out here; men tramp and live like dogs’. The Royal Mail (Hungerford Pub) is so called because Cobb & Co used it as a staging station and a mail drop off and collection point. Cobb and Co was set up after gold was discovered in Victoria in the 1850s. People from all over the world rushed to the diggings and amongst the crowds were four young Americans. One of them, Freeman Cobb, saw the potential and started a stagecoach company like those in the United States. 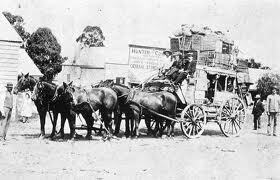 The first Cobb & Co coach ran on the 30th January 1854 carrying passengers from Melbourne to the Forest Creek diggings. From that humble beginning Cobb & Co expanded their operation, carrying passengers and mail to all points in the colony. Coaches averaged 12 kph and horse teams were changed every 30 kilometres. Drivers took their teams through forests, deserts and flooded creeks and were often waylaid by bushrangers. Cobb & Co had a network stretching from Victoria to Normanton in the Gulf and prided themselves in being the fastest passenger and mail service in Australia. The success was largely due to its people – the coachbuilders, grooms, horse breeders, dynamic managers and, above all, the remarkable coachmen that established the company’s reputation and made sure the service operated to the highest possible standard. Stories of Cobb & Co, and the tracks it pioneered, are significant parts of this country’s history, legend and culture and give depth and character to the Australian image as we know it today. A Cobb and Co coach loaded to the hilt in 1909. The load on the top is mail baskets. I can imagine that the two passengers sitting in the ‘box seat’ (considered the best seats on the coach) closed their eyes on occasions when the coach thundered down steep hills or came into corners at speed. The text that came with this image from the National Archives of Australia stated that the coach was carrying a full complement of passengers, three rows of four sitting inside and two in the ‘box seat’. The three rear horses were called polers, they were the horse power (did most of the pulling) and the three across the front set the pace and responded to the reins. The driver, a bloke called Alf Jensen, died from pneumonia three years after this photograph was taken as a result of becoming ill after driving during a long wet spell. My curiosity is now stirred; I will have to find out more about Alf. If you want to read more about this image go to National Archives of Australia. Image Cobb and Co Coach Ref J2879, QTH 313/4, it’s a fascinating story. The advent of the motor vehicle in the early 20th century saw the general decline of the coaching industry and led to the eventual closure of Cobb & Co. Most New South Wales coach lines had ceased operating by 1897 (although some licenses were still held in the Bourke area until 1916) and Cobb & Co’s Charleville factory closed in 1920. The last coach run for Cobb & Co was between Yuleba and Surat in Queensland on 14 August 1924 – just over 70 years after the first passenger coach had rolled out of Melbourne. The company’s partnership dissolved in 1929. When we first started visiting the Hungerford pub it had a lot to offer those with an eye for detail. For example, where the header (the horizontal timber support sitting on top of the post) were, small stones acting as spacers and a wire Cobb & Co hitch held the header and post together. 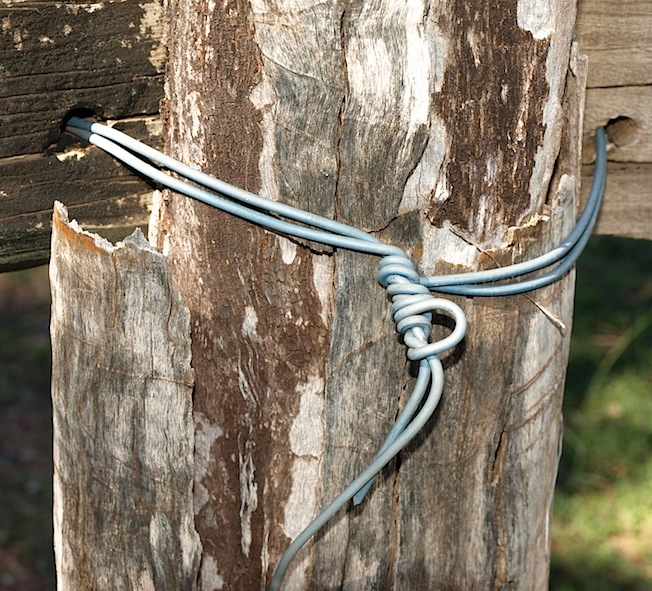 A Cobb & Co hitch is a very effective way of holding two lumps of wood together; all that is needed is a length of fencing wire and a pair of pliers. You double the wire around the two objects you want to hold together give them a preliminary twist then put the handle of the pliers in and twist again. Each consecutive twist winds the wire on itself resulting in a secure hitch. When we travel in the outback we always carry a short length of fencing wire because you never know when a hitch may be required. On a number of occasions I have re-attached fellow travellers’ exhaust pipes using a Cobb & Co hitch. The present manager of the Royal Mail Hotel, ‘Lord Barr’, said ‘Lawson was definitely not impressed with Hungerford or the ruffians who lolled about in front of the hotel’. Things have changed now, of course; it is mostly the well-heeled 4WD travellers who loll about out the front of the pub. 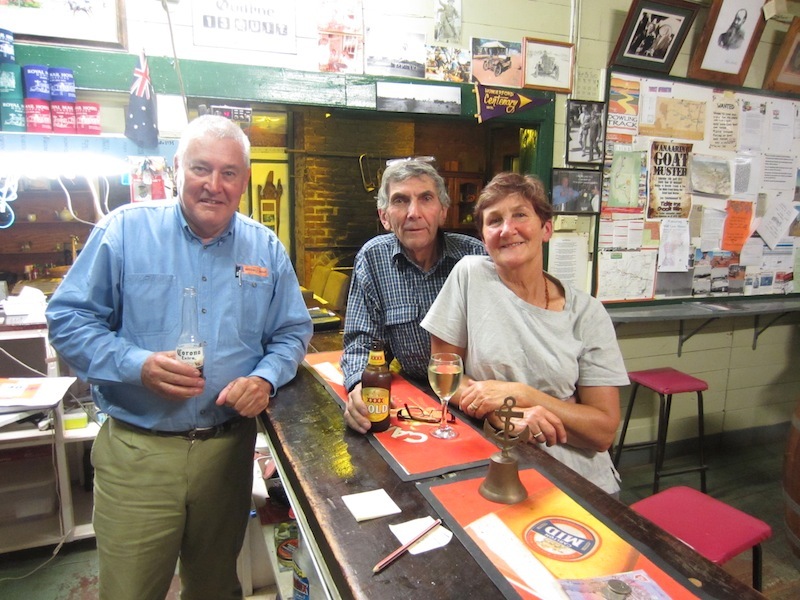 Hungerford pub has an addictive attraction for us as it is a great place not only for history but also a place to yarn with the locals, have a beer, a meal and lose yourself in a comfortable bed. One day I would like to stay at the Royal Mail Hungerford with a group of Lawson enthusiasts and have readings of Lawson’s work, it could be a couple of fun days. How about organising it Lord Barr? The quaint outside bathroom at Hungerford Pub. Interior of bathroom. I reckon this beats any modern facility. I love its primitive charm, ripple iron walls and improvised hand basin. A mile better than sitting on a steel tractor seat in the middle of a claypan! 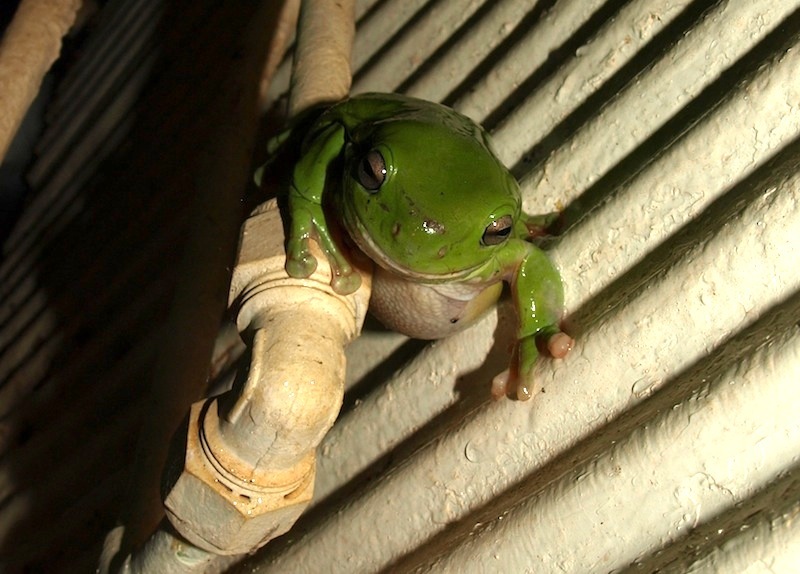 I’m not sure why this species of frog is called the Green Tree frog (Litoria caerulea) because you are more likely to see them around shower blocks and toilets. I think it should be called the Dunny Frog because their favourite abode is under toilet seats. At our property there is a family of them living in the outside dunny and when they croak you know you have sat on one or there is rain on the way. 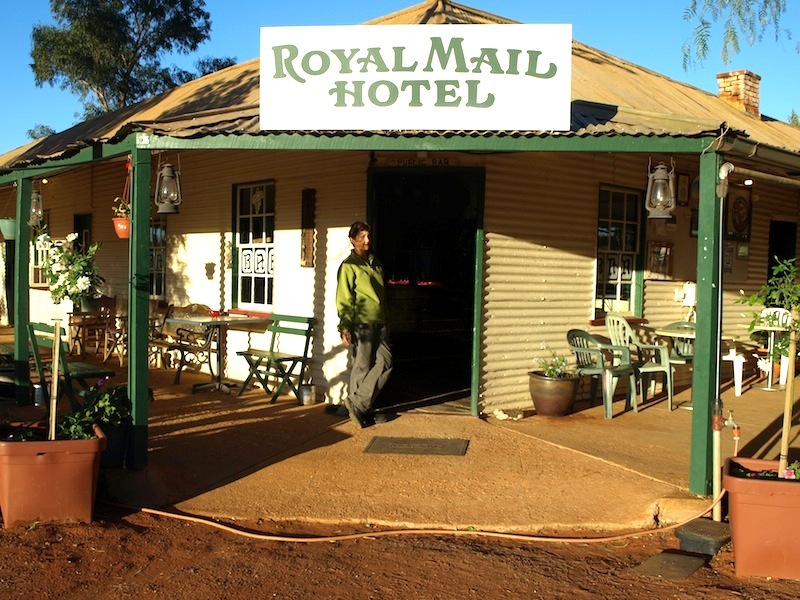 If you are heading for western Queensland, have a night at the Royal Mail at Hungerford. Take my word for it, you won’t regret it. Tomorrow we head north across the Paroo River, west along the dog fence and then on to Kilcowera Station for a couple of nights.